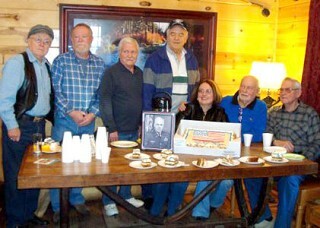 Dear friends and family gathered at Sisters Coffee Company on Monday, March 22, to observe and honor the 100th birthday of Lt. Col. Robert (Bob) Taggart. Taggart passed away quietly in December 2008, just 18 months shy of the milestone century mark. He was a smiling force in Sisters, often regaling his "veteran buddy" coffee group with remembrances of a distinguished career in the armed forces, serving in both World War II and Korea, and earning two silver and two bronze stars. Deborah Halsten sliced two birthday carrot cakes, fittingly decorated with stars-and-stripes icing, while guests sipped coffee and offered memories of Taggart. "Bob was larger than life and he had a thousand stories," said Halsten. "And what a sense of humor! Bob did a lot of amazing things in one lifetime, but he was also a very humble person." Taggart was born in Glen Jean, West Virginia, in 1910, ushered in by the shimmering tail of Halley's Comet in the night sky. Halsten's father, Spud Halsten, was one of Taggart's close friends and offered details over a second piece of carrot cake. "In the Army, he went from buck private to sergeant major in seven months. That usually takes 20 years in the Army to accomplish. "He never asked his men to do anything he wouldn't do," Spud recalled. "This man lived a wonderful life. He loved to joke around and laugh with everyone. Spoke multiple languages. Loved movies. Even played trombone in a circus band and a dance band." On the morning of April 29, 1945, Taggart's division in the U.S. Seventh Army was one of the first to enter and liberate the concentration camps at Dachau. Many of his photos were used as evidence of the atrocities and are in collections around the world. "Eisenhower told him to take pictures because he thought no one will ever believe it," said Spud. After retiring from the Curtis Publishing Company, in Washington, Taggart finally retired to Sisters with his wife, Margaret, in 1988. Peggy Marshall remembers Taggart as a very special guy. "He was a Southern gentleman and he always gave me his arm when we met. I sure miss him. He left so many friends behind."